The approach detailed below is a several decades old classic, however recent developments of Lokad around probabilistic forecasting are now making the safety stock model somewhat obsolete. Indeed, the reorder point is nothing but a quantile forecast. Hence a direct calculation of the quantile vastly outperform, on average, an indirect calculation, as provided by the safety stock model. This guide explains how to optimize inventory levels by adjusting safety stocks to their optimal level. This guide applies to retail and manufacturing. The theory is illustrated with Microsoft Excel. Advanced notes are available for software developer who would like to reproduce the theory into a custom application. Intended audience: This document is primarily intended for supply chain professionals in retail or manufacturing. Yet, this document is also useful for accounting / ERP / eCommerce software editors that would like to extend their applications with stock management features. We have tried to keep the mathematical requirements as low as possible, yet we can’t really avoid all formula altogether since the precise purpose of this document is to be a practical guide that explains how to compute safety stock. Inventory management is a financial trade-off between inventory costs and stock-out costs. The more stock, the more working capital is needed and the more stock depreciation you get. On the other hand if you do not have enough stock, you get inventory stock-outs, missing potential sales, possibility interrupting the whole production process. demand: the amount of items that will be consumed or bought. lead time: the delay between reorder decision and renewed availability. demand variations: customer behaviors can evolve in rather unpredictable ways. lead time variations: suppliers or transporters may be faced with unplanned difficulties. Deciding the level of safety stock is implicitly equivalent to making a trade-off between those costs considering the uncertainties. The balance inventory costs vs. stock-outs costs is very business dependent. Thus, instead of considering those costs directly, we will now introduce the classical notion of service level. The service level expresses the probability that a certain level of safety stock will not lead to stock-out. Naturally, when safety stocks are increased, the service level increases as well. When safety stocks get very large, the service level tends toward 100% (i.e. zero probability of encountering stock-out). Choosing the service level, i.e. the acceptable probability of stock-out, is beyond the scope of this guide, but we have a separate guide about calculating optimal service levels. Get optimized safety stocks with our inventory forecasting technology. Lokad specializes in inventory optimization through demand forecasting. The content of this tutorial - and much more - are native features of our forecasting engine tool. The reorder point is the amount of stock that should trigger an order. If there was no uncertainty (i.e. future demand being perfectly known and supply being perfectly reliable), the reorder point would simply be equal to the total forecasted demand during the lead time, also called lead time demand. Lokad provides many tools to compute the lead time demand directly from the historical data. You can have a look at our Forecasting Methods and Formulas with Microsoft Excel. If we assume that the forecasts are not biased (statistically speaking), having zero safety stocks would lead to a service level of 50%. Indeed, unbiased forecasts mean that there is as much chance for the future demand to be greater or lower than the lead time demand (remember that the lead time demand is just a forecasted value). Caution: forecasts can be unbiased without being exact. The bias indicates a systematic error by the forecast model (ex: always over estimate the demand by 20%). At this point, we need a way to represent the uncertainty in the lead time demand. In the following, we will assume that error is normally distributed, see the picture below. Statistical notes: this normal distribution assumption is not totally arbitrary. Under certain situations, statistical estimators converge to a normal distribution as outlined by the Central limit theorem. But those considerations are beyond the scope of this guide. A normal distribution is only defined by two parameters: its mean and its variance. Since we assume the forecasts to be unbiased, we assume the mean of the error distribution to be zero, which does not mean that we are assuming a zero error. Determining the variance of the forecast error is a more delicate task. Lokad, as most forecasting toolkits, provides MAPE estimations (Mean Absolute Percentage Error) associated to its forecasts. For the sake of completeness, we will explain how simple heuristics can be used to overcome this problem. where E is the mean operator, yt is the historical demand for the period t (typically the amount of sales) and y' the forecasted demand. The key idea behind this assumption is that the forecast error is very often correlated to the amount of expected variation: the greater the upcoming variations, the greater the error in the forecasts. Actually, the computation of this error variance involves a few subtleties that will be treated in greater details below. At this point, we have determined both the mean and the variance, thus the error distribution is known. We must now calculate the acceptable error level within this distribution. Here above, we have introduced the notion of service level (a percentage) to do that. In order to convert the service level into an error level also called the service factor, we must use the inverse cumulative normal distribution (sometimes also called inverse normal distribution) (see NORMSINV for the corresponding Excel function). As it might sounds complicated, it is not, we suggest to have a look at normal distribution applet to get a more visual insight. As you can see, the cumulative function transforms the percentage into an area-under-the-curve, the X axis threshold corresponding to the service factor value. where σ is the standard deviation (i.e. the square root of σ2 the variance defined here above), cdf the normalized cumulative normal distribution (zero mean and variance equal to one) and P the service level. So far, we have been simply assuming that for a given lead time, we were directly able to produce the corresponding future demand forecast. In practice, it does not exactly work that way. The analysis of the historical data usually starts by aggregating the data into time periods (weeks or months typically). Yet, the chosen period may not exactly match the lead time; thus, some further calculations are required to express the lead time demand and its associated variance (considering that we are still assuming a normal distribution for the forecast error, as detailed in the previous section). Intuitively, the lead time demand can be computed as the sum of the forecasted values for the future periods that intersects the lead time segment. Care must be taken to properly adjust the last forecasted period. where y'n is the forecasted demand for the nth period in the future. This section details how to calculate the reorder point with Microsoft Excel. We suggest to have a look at the sample Excel spreadsheet provided. The sample sheet is basically split into two sections: the assumptions at the top and the calculations at the bottom. The forecasts are assumed to be part of the assumptions because sales (or demand) forecasting is beyond the scope of this guide. You can refer to our tutorial for sales forecasting with Microsoft Excel for details. NORMSINV (Microsoft KB): estimates the cumulative normal distribution, noted cdf here above. STDEV (Microsoft KB): estimates standard deviation, noted σ here above. We recall that the standard deviation σ is the square root of the variance σ2. For the sake of simplicity, the first sheet does not implement the heuristic σ2 = E[ (yt - y')2 ] when calculating the service factor. 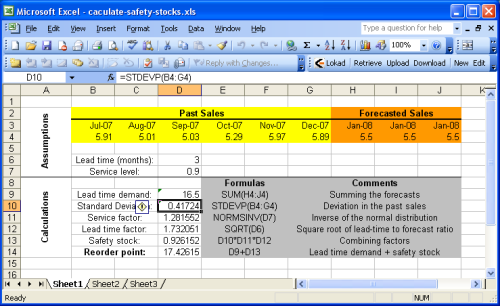 This approach is implemented in Sheet2 (2nd spreadsheet of the Excel document). Since we have assumed stationary forecasts in the example, the reorder point remains identical with or without this heuristic. This section is intended for developers who want to implement a replenishment feature for automated inventory management. Most of the formulas expressed in this guide can be concisely implemented with regular development tools. If you happen to work with .NET, we suggest to use Math.NET Numerics an open-source mathematical library written in C# that provides both the standard deviation operator and the cumulative normal distribution function. Otherwise, the standard deviation can be easily re-implemented based on its definition, see the Wikipedia page. The cumulative normal distribution is slightly more complicated, but Peter J. Acklam provides a good algorithm that has been implemented in many languages. The code dedicated to those two methods should not require more than a few dozens of lines.